Our new update has accents on reports improvements - now they’ve become more convenient, slight search updates for the comfortable look up and little bit of new stuff for the cash desk which are going to let you see the picture more fully. This is a totally new kind of report. It is quite specific and answers only one simple question – how did the day carried? 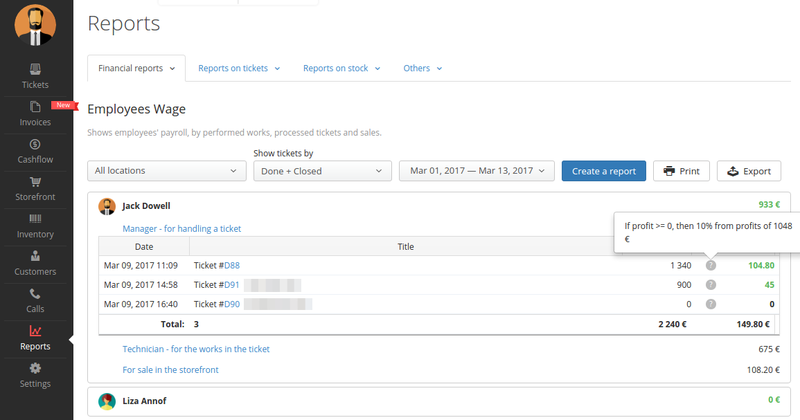 Daily report consists of three sections: "Tickets opened", "Works done" and "Cashflow"
Let’s take a look at it closer. "Works done" shows productivity of your workers. It takes absolutely all services provided for the tickets yesterday. No matter what status ticket has, was it paid or not. the main thing is that worker has done services for the ticket. Now all of your employees are in a clear sight. "Cashflow" shows flow of money in your company. “Customer paid” - refers to sum of all the customer payments for tickets and sales for all the cash desks of the company. "Refunded" refers to the sum of all refunds by overpayment of tickets or returned sales. Maybe you have your own productivity indicators which you would like to see in this report? 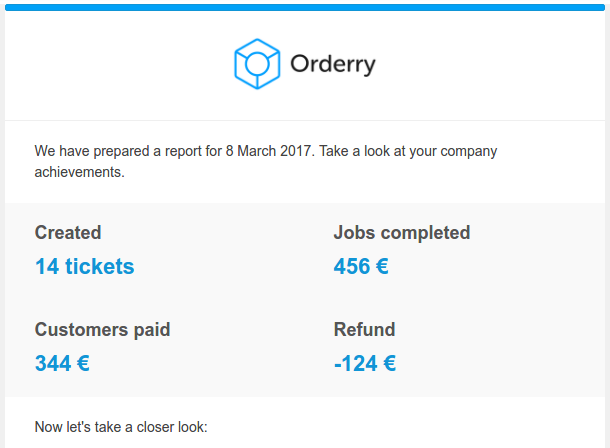 We have reworked our wage report and now it become smoother and easier to use. New report has three levels of detalization. The deeper level is - the more details you can get. First level shows employee name and total his earnings. Click it to open the second level. The second level shows how much did employee earned for each of calculation types. By clicking the calculation type we enter the third level of the report. Third level is the most detailed. Here you can find detailed explanation of what the exact calculations for the employee consists. Note that third level a hint marked with question mark. By opening it you can get the formula by which it calculations were made. Now our search become more agile, as we taught it to find customers by separate words. Now, you can combine few words together and maker more complicated search queries. For example, when you type in “Iphone 7 button” - You will receive all the possible results containing these three words. And if you want our search to ignore some specific words, you should just put “!” in front of the desired word. For example query “Iphone !6” - will result a list of all the available Iphones, except for all iphone 6 devices. To start with, we have upgraded our cash desk transactions - and from now on they can show you much more information at a time. If you are using our cashflow accounting option (You can set it in "Settings > Common"), the cashflow item for every transaction will be displayed right in the cash desk table. The next one is that we have added the ability to add customer to every cash desk transaction. 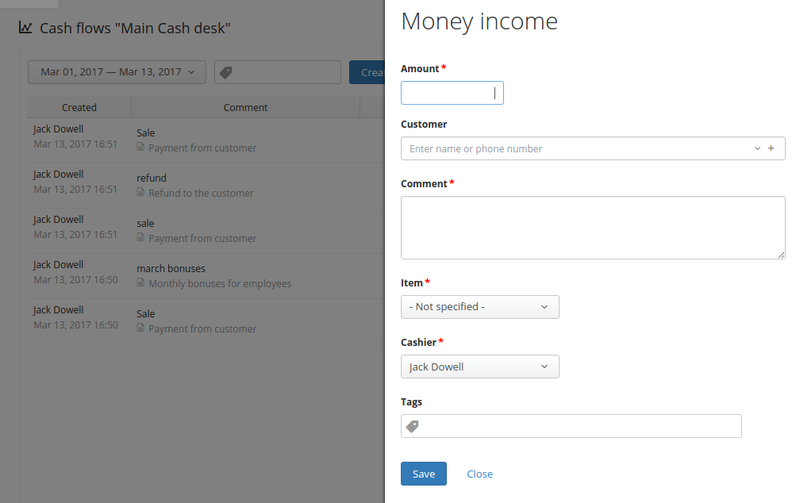 Now, when doing any kind of cashflow operation you can set a customer in there. We have added a new document template “Itinerary sheet”. To print this document you need to check few tickets in the ticket table, then, open mass edit menu and choose “Print list of tickets”. The document for print will consist of table with the information about chosen tickets. You can edit this document or create a new one at "Settings > Document template"